Back Squat is a fantastic leg exercise that targets your Glutes, Hamstrings and Quadricep muscle’s as well as working your general core. This is the best way to improve squatting strength and tone your legs and buttocks. 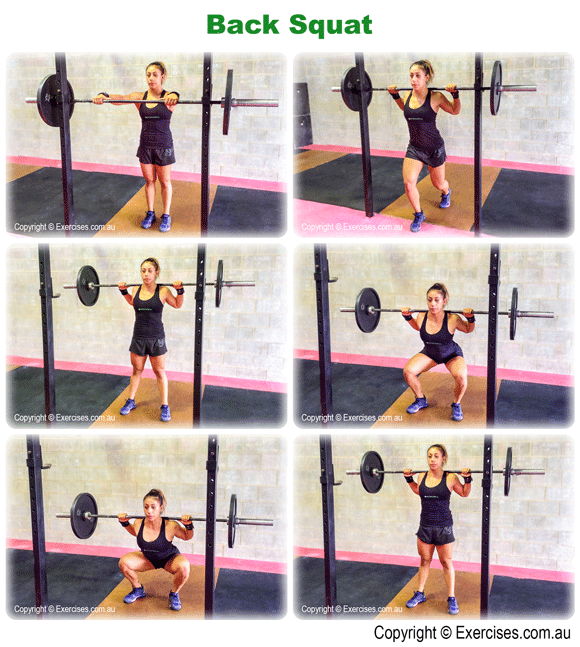 A quality strength, Olympic lifting or power lifting program should include Back Squats on a weekly basis. Working out of racks, center the hands on the bar just outside shoulder width. Drive hard through the heels until hips and knees are fully extended and you are standing tall. To repeat the rep, release the breath and take another and lock the core again ready for the squat. Squatting too fast and “bouncing” out of the bottom position with the bar pushing you forward onto your toes. When standing, knees extending pushing the hips up while the shoulders do not rise. Always lock your breath in keep a tight core, stay on your heels and have active knees on the way down and especially when driving out of the bottom of the squat. If you are squatting heavy, do so in a power rack with safety bars or have someone spot you.